Hot Wheels After School offers an excellent summer camp program to keep kids happy every day this summer (closed Memorial Day and 4th of July.) We are open 7 a.m.- 6 p.m. M-F and offer Full and Part time rates to best fit your needs! Download and print the forms below and bring in your non-refundable registration fee to get enrolled today! 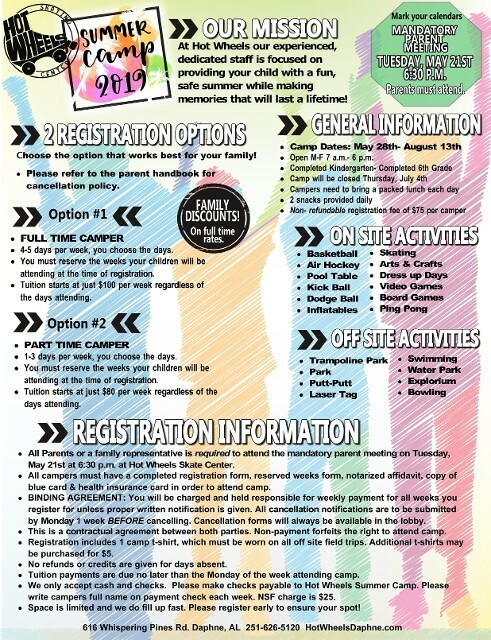 2019 Summer Camp Registration Form Weeks attending Form BOTH forms must be COMPLETELY filled out before we will accept them. Then.... Affidavit Form print and fill out this form and take it to be notarized. Every summer a new form is required to be notorized and must be completed before registration forms will be accepted. Finally.... $75 cash or check for your non-refundable deposit.